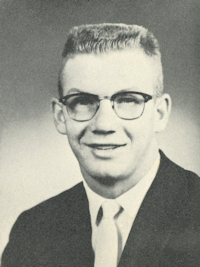 Obituary – Milliron, Robert G. « Perry High School Alumni Association, Inc.
Obituary – Milliron, Robert G.
Student Council 53-56, Football 5356, Basketball 53-56, Basketball Co-Captain 54-55, Annual Play 54-55, All School Revue 53-55, Junior Class Vice President 54-55, Class Assembly 53-54. Robert G. Milliron, 74, of Erie, KS died at 8:35 p.m. Wednesday, March 9, 2011, at Chanute Health Care Center. He was born on Dec. 27, 1936, at Perry, Okla., to Arthur and Wilna (Cowell) Milliron. He was raised in Perry and attended school there and was a Perry High School graduate.. He later moved to Enid, Okla., where he attended college. After college, he lived in various communities in New Mexico, working as an X-ray technician in hospitals. He returned to Oklahoma in 1989 to care for his mother. Following his retirement, he moved to Erie. He was married to Joyce Sutherland for the past 21 years. She survives of the home. Additional survivors include a son, Robert Matthew Milliron, and his wife, Ann, of Lubbock, Texas; two daughters, Judy Hodgkiss and her husband, Ted, of Georgetown, Texas, and Nancy Milliron of Hobbs, N. M.; two stepdaughters, Lori McKinney, and her husband, Robert, of Chanute and Dina Schultz and her husband, Randy, of Montgomery, Ala.; 10 grandchildren; five great-grandchildren; two brothers, Virgil Milliron and his wife, Lou, of Oklahoma City, Okla., and Darrell Milliron, and his wife, Doris, of Watonga, Okla.; and a sister, Carol Ann Walls and her husband, Keith, of Huntsville, Ala; and two cousins in Perry, OK: Karen Wilcox and Rick Milliron. He was preceded in death by a brother and an infant daughter. The service will be at 11 a.m. Monday at First Christian Church at Erie. Memorials are suggested to Horizon Hospice and may be left at the church the day of the service or mailed to Joyce Sutherland, 529 N. Main, Erie, 66733.